ILRI assistant director general Shirley Tarawali presents ILRI’s distinguished panel members and welcomes guests to ILRI’s 40-year anniversary conference in Addis ababa, Ethiopia, 6–7 Nov 2014 (photo credit: ILRI/Apollo Habtamu). This article is written by Ewen Le Borgne, team leader for Knowledge, Engagement and Collaboration at ILRI. The sweet spot was when ILCA and ILRAD merged. The sweeter spot is here and now, with research and development coming together. How do you start life at 40 (or, how do you keep your ‘spot sweet’)? Here’s how we did it at the International Livestock Research Institute (ILRI), which turned 40 years old in 2014. We organized a series of events with old and new colleagues, partners and friends, and with them looked back on what we have accomplished in the past 40 years and fleshed out ideas for the next 40. All that was very much on the agenda of the first day of ILRI’s ‘ILRI40’ conference in Addis Ababa last November, which took stock of today’s smallholder livestock systems and did some crystal-ball gazing about where they are going, where they should be going, and how they can grow in sustainable as well as profitable, productive and equitable ways. This event was under the motto ‘Livestock-based options for sustainable food and nutritional security, economic well-being and healthy lives’. 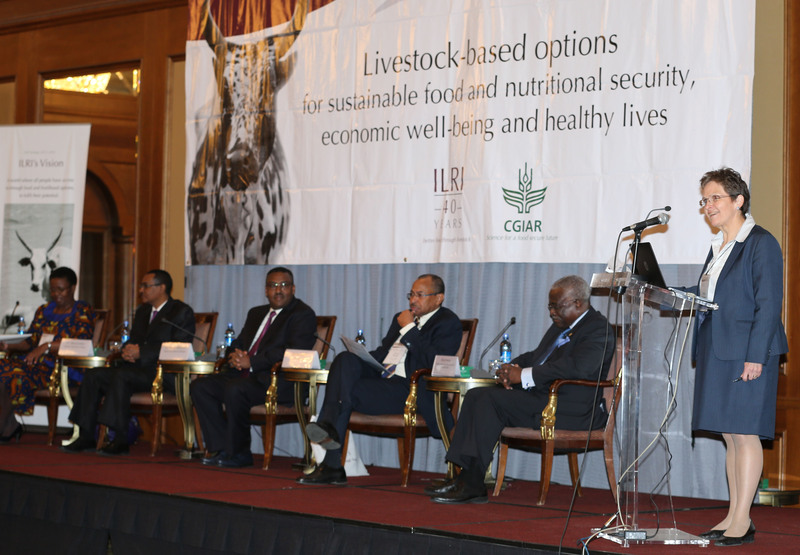 6 Nov: A high-level conference was held at the Sheraton Hotel in the city’s centre to sketch out the key challenges for livestock research for development to 2054. 7 Nov: A scientific conference on the ILRI campus tackled current challenges in livestock research for development and identified potential solutions and ‘best bets’ to address them over the next 40 years. 8 Nov: An ‘open day’ on ILRI’s campus gathered current and former staff of the International Livestock Centre for Africa (ILCA), the International Laboratory for Research on Animal Diseases (ILRAD) and ILRI, who reminisced about the past while discovering what ILRI’s science and campus are like today. Guests on the first morning of ILRI’s two-day 40-year anniversary conference in Addis Ababa, Ethiopia, 6 Nov 2014 (photo credit: ILRI/Susan MacMillan). The 250 or so participants that gathered at the Sheraton Hotel on the first day of the ILRI40 program in Ethiopia were not encouraged to take a ‘trip down memory lane’ (although the poster gallery provided some of that with a series of vintage photo albums of ILRI) but rather to participate in a comprehensive overview of the key issues that ILRI is grappling with now and that small-scale livestock-sector actors are likely to face over the next 40 years. 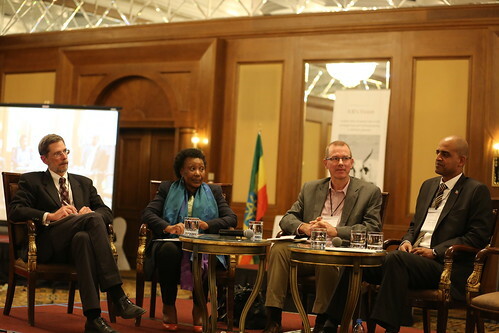 Distinguished speakers, who included His Excellency Demeke Mekonnen, deputy prime minister of the Federal Republic of Ethiopia; Lindiwe Majele Sibanda, chair of the ILRI Board of Trustees and CEO of the Food, Agriculture and Natural Resources Policy Analysis Network (FANRPAN); Kanayo Nwanze, president of the International Fund for Agricultural Development (IFAD) and other plenary speakers, that day characterized the current livestock sector issues. Here are some of the points they raised. One billion people depend on livestock to some extent for their livelihoods, and not just mixed farmers but also pastoral herders, forest dwellers and fisher folk. In Ethiopia as elsewhere in the developing world, livestock production is likely to increase three- to four-fold, generating many benefits and opportunities, from highly nutritious animal-source foods to agricultural insurance to new livelihood options, such as those involved in processing livestock foods. Productivity and sustainability are both important drivers of a healthy livestock sector, as is means for scaling up the adoption of new technologies by small-scale farmers. ‘Game-changing’ livelihood options are needed to help people create sustainable, equitable and resilient futures and make the most of the livestock revolution that is starting to hit Africa. Human-induced climate change is real and livestock play a significant role in it, both negatively (livestock emit greenhouse gases that are warming the planet) and positively (livestock serve smallholders as flexible and fungible resources and ‘buffers’ that enhance their resilience to climate change). Using current technologies, we can reduce livestock greenhouse gas emissions by 30%, but we do not know (yet) how this will affect productivity. Livestock are not (yet) targeted by carbon markets and, with the possible exception of New Zealand, no country (yet) has set upper limit targets for the greenhouse gas emissions of their livestock sector. The speakers also sketched some key priorities and opportunities for the future, such as the following. Where is our research on ‘backyard’ livestock such as guinea pigs and rabbits, which increase sources of essential protein for the poor? Why don’t we invest in appropriate (and cheap) farming technologies such as animal traction? There is a moral, social and economic imperative for research to feed farmers, herders, fisher folk, etc. We have to build sustainable economies. Let us all ensure that these women, men and children are at the core of our rural development. We should make better use of existing resources, for instance by making better use of crop by-products to improve overall sustainability. When it comes to genetic improvements, the sky is the limit. Developing capacity and involving marginalized groups in our projects, especially women—since there are ten times more women who own livestock than land—are among of top priorities. Economic well-being panel at ILRI@40 conference 6 Nov 2014, Addis Ababa (photo credit: ILRI/Apollo Habtamu). Following these keynote addresses, a series of roundtable sessions delved into the following three specific themes, leading to their further unpacking and highlighting some of the challenges and possibilities that livestock offer now. Farmers are private sector. Farming is a business first and foremost. Livestock returns on investment will have to be scaled up and encompass peri-urban farming, pastoralist credit and self-regulating entrepreneurship. Different types of partnerships will be required, particularly more work with the private sector and with regional economic bodies such as the Intergovernmental Authority on Development. Learning and exchange of best practices should occur at regional levels. We have to think about how to keep farming inclusive, with public research helping to maintain small-to-medium sized farming systems competing with large agro-businesses. We must continue to develop technologies and solutions that governments need to support smallholder businesses. We must help smallholder farmers participate in the transformation of livestock systems that will happen anyway. We should build on the contributions smallholders are already making to agriculture. Women and youth should be much better integrated into livestock-relevant institutions and capacity development should greatly enhance agricultural extension services. The future of livestock lies at the intersection of productivity, food safety and respect for the environment. We want smart farmers that produce safe milk from green cows. Livestock currently have a bad reputation among some groups in industrialized countries, where environmental and health concerns trump those of food security and livelihoods. Managing livestock ‘bads’ will not get simpler as livestock intensification could increase environmental pollution, contamination of foods and the incidence/magnitude of emerging zoonotic diseases, the latter of which are already appearing every three to four months. Use of advanced information technologies promises to integrate vast data sets to help detect, assess and control infectious diseases. ILRI should continue to strengthen One Health approaches to better managing zoonotic diseases. Lindiwe Majele Sibanda summarized some of the priorities for ILRI in 2014 and the near future: Partnerships, providing science and evidence that the livestock sector improves lives, and improving capacity among key stakeholders to make better use of livestock science. 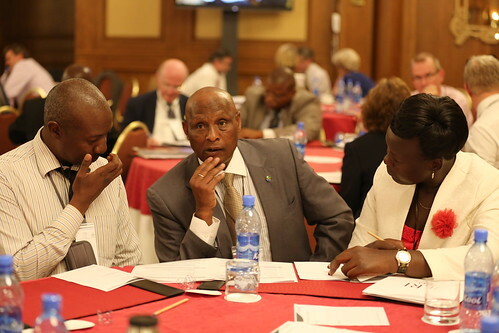 On the second day of the conference, participants worked largely in groups to begin proposing specific ways research can help enhance the rapidly changing livestock systems of poor countries — so as to get to a new sweet livestock spot by 2054. 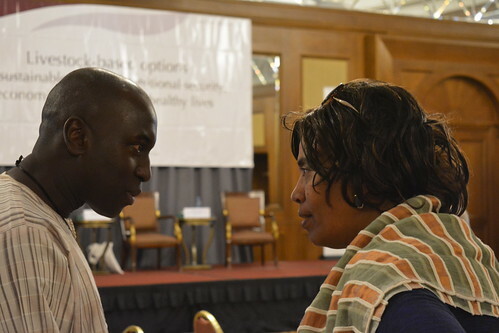 Participants discuss investing in livestock options in a ‘Where’s the Beef?’ session at the ILRI@40 conference on 6 Nov 2014, Addis Ababa, Ethiopia (photo credit: ILRI/Apollo Habtamu). Visit ilri.org/40 to find out about all the ILRI@40 events. A playlist of all our videos of the ILRI@40 Addis event is on Youtube. Tags: Ewen Le Borgne, IFAD, Jurjen Draaier, Kanayo Nwanze, Lindiwe Majele Sibanda, Lorne Babiuk, Lucy Lapar, SNV, University of Alberta. Bookmark the permalink.